recommended for: Fans of Alice in Wonderland (obviously), Tim Burton, Some Quiet Place by Kelsey Sutton, and whimsical adventure. I was in love with this book the instant I read the blurb. Alice in Wonderland is a particular obsession of mine (enjoy these photos of my Mad Hatter and American McGee's Alice costumes if you want a taste of how obsessed) and so I'm eager to snap up anything Wonderland-related. 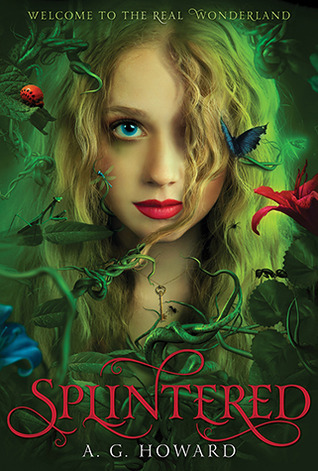 Still haven't gotten to Alice in Zombieland by Gena Showalter, but Splintered was a must-read. Why? It takes a fantastically clever spin on the Alice-remake by making Alyssa not Alice herself, but a descendant of a real person--Alice Liddell--and adding the twist of the Liddell curse of madness. Pretty cool. While some of the details were a little too close to Tim Burton's remake for my taste, Howard impressed me by taking her own spin on Wonderland's myths and creatures. She uses Alice's youth as a mirror to put her own spin on Wonderland; in Alice's childlike eyes, the bizarre skeletal Rabid White becomes the White Rabbit, and so on. Put it all together and you get a breakneck plot that oozes adventure, terror, and a surprise ending that blew me away. Howard knows how to keep you reading. It starts right in the middle of a mystery--Alyssa who can hear bugs and flowers talking, her mad mother who did something terrible, the strange moth following her around. Then we're down the metaphorical rabbit hole and in a strange world where some things are very familiar, and some things not as Alyssa would expect. It's also important that her friend Jeb comes along, because it creates some complications for Alyssa, who is torn between the world she feels is her own and the world she's lived in. And of course a love triangle. However, it was not as annoying as your typical triangle because Alyssa didn't spend half the book angsting over it. The romance was a product of the plot, not a replacement. And the plot was breathtaking. One adventure after another, but it all felt like one big thing building up. The twist ending was shocking. I won't even hint to spoil it. I left the book starving for the sequel. Howard's remake is what a remake should be--an extension and reimagining of the original, not just a blow-by-blow appropriation of the old material. She takes Carroll's world and imagines: what if young Alice wasn't right about everything she saw? What if a part of Wonderland stayed with her? And, what happened to Wonderland after she left? Those questions give us a new kind of Wonderland. A Wonderland where some of the creatures are a little darker. Where the Red Queen is dead but usurped. Where the caterpillar is all grown up (and sizzling hot). Where Alice's descendants are still feeling the backlash of her strange encounter. It's thrilling and exciting and makes up for all the bits that stray a little too close to Tim Burton. Alyssa was an instant win for me. She's a skater girl but she's not that good. She gets picked on but doesn't angst (too much) over it. She's got a hopeless crush but it doesn't control her life. She has a "crazy" mother but doesn't use her as an excuse to be tragic. She could have been Mary Sue, but Howard made her real instead. I did find her a little Sue-ish considering how badly the other kids made fun of her for being Alice's descendant, considering I'm pretty sure most middle schoolers and even high schoolers wouldn't care that much, but I let it go. Jeb and Taylor were meh. I felt they made Alyssa a little more Sueish than she should have been. Taylor had it out for Alyssa for unknown reasons, and Jeb's romantic confession was a bit over-the-top for me. Not enough to ruin the book, but enough to notice. Morpheus was a win. He's your typical seductive, snarky bad-boy type, but the best part is that Alyssa sees that and doesn't entirely fall for it. You never know whose side Morpheus is on, and that gives him some depth. The supporting cast (mom, dad, etc.) were all fleshed enough to give the story spice. Beautiful but not overdone. Howard can turn a phrase like the best of them, but she doesn't bog you down in flowers either. I enjoyed some of her descriptions immensely. She gives you a great pictures of not only what Wonderland looks like but what it feels like. She also gives Alyssa her own voice, which feels authentic and not too old for her years. I felt immersed. Everything was well polished. I can't really think of anything to complain about. A dark Alice in Wonderland that goes way beyond remake and tells its own, thrilling story. This was probably my favorite book of 2012! I got an ARC and read it in just a few hours! Glad you liked it. I am so looking forward to the second book! I agree! This one has re-read potential. Took me more than a few hours, but not by choice. ;) I'm DYING for an ARC of Unhinged. I guess I'll just have to live on sample chapters unless I get lucky somehow.